Located on the beautiful beach at the Iberostar Playa Paraiso complex, this resort is in perfect harmony with the surrounding ecological environment. Enjoy seven restaurants plus two international buffets and two snack bars. The resort features an 80,000 square foot pool with a center island covered with palm trees, Jacuzzis,® pool and kid's pool. Enjoy the various dining options and daily activities, or just relax on the beach. Directly on the beautiful beach of Playa Paraiso, between Puerto Morelos and Playa del Carmen. 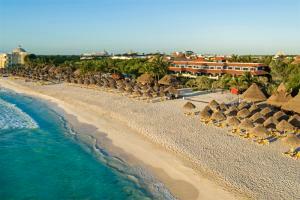 Approximately 30 minutes from Cancun International Airport.